No question about it, purchasing a hot tub for your home is a major decision. When choosing on a hot tub, the heating element is a major factor since it is a major component and a key factor in energy efficiency. Cal Spas has made this decision a lot easier with the introduction of our PureHeat™ heating system. The benefits of the PureHeat™ heating system are really two-fold, first by designing the heating element so that it never touches the water, you protect one of the more costly elements to replace in any hot tub. Secondly, the oversized heating surface and high-density insulation you keep the hot air in and the cold air out reducing heating costs and increasing energy efficiency. 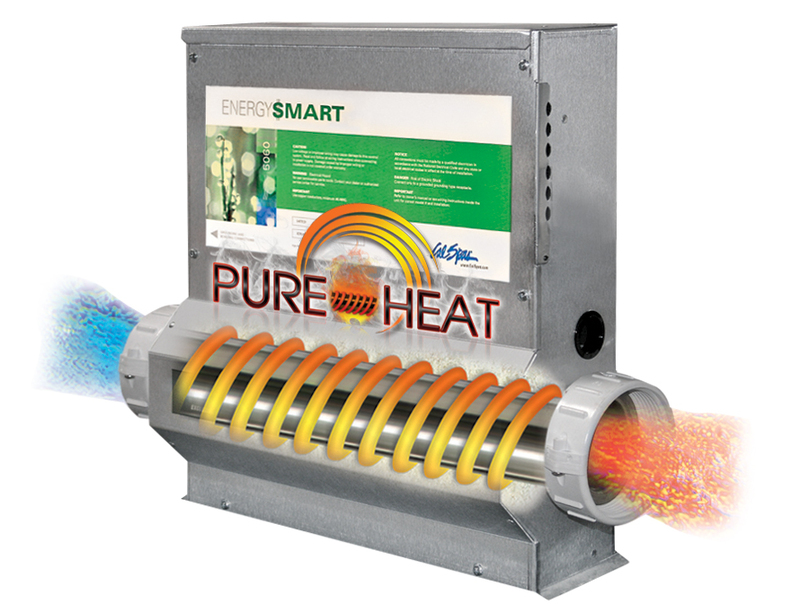 PureHeat™ is backed by the longest warranty in the industry. Eco-friendly 5.5 kW heater reduces heating costs. Protects your heater by never allowing the heating element to come in contact with the water. The oversized surface area of the heating chamber allows more water to be heated quicker, reducing heating costs. High–density insulation drives heat into the water instead of dispersing heat into the water instead of dispersing heat into the air. Discover why Cal Spas is the leader in product innovation and constantly striving to improve their products. We take the worry out of purchasing a spa so all you have to do is relax.